The sentries then made a samadhi and later this temple was built. Although Harbhajan Sing is no more, the sentries and guards here believe that his spirit is still alive and he is therefore treated as a living being. They all believe that Harbhajan will guard and protect them in this very difficult terrain. In fact there has been reports that Chinese soldiers across the border having seen a turbaned sentry doing his rounds at night. Many sentries here believe that Harbhajan comes here every night as his camp bed sheet gets crumpled every morning and his polished shoes turn muddy by the evening. 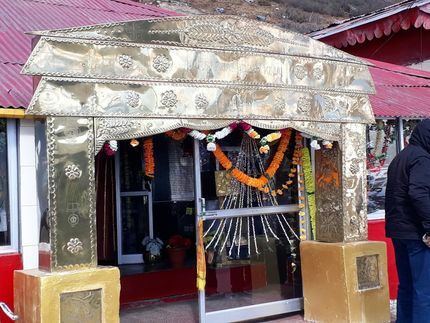 This temple is also known as the New Baba Mandir because the original bunker of Baba Harbhajan is located further up near Nathang Valley (located on the historic Silk Route) where the original or the Old Baba Mandir was built. But due to its difficult terrain, many tourists can not make it to the old mandir. One also requires to climb several steps in high altitude to reach up to that temple. 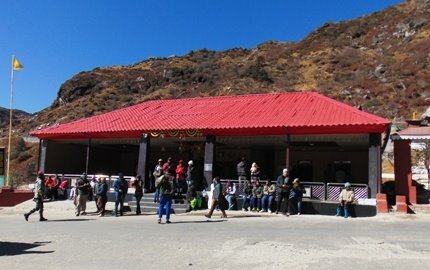 So for tourists' convenience a new baba mandir was constructed here on 11th November 1982 at the junction of the road leading to Kupup/Nathang and the trail to Menmecho lake. If you want to visit the old Baba mandir and like to know what else can you see there, then read historic Silk Route. Hi, foreign nationals, NRIs and OCIs are not allowed to visit Baba Mandir. You can go only up to Tsomgo lake.